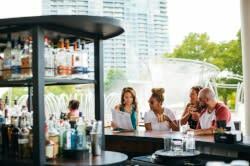 This post is written by Carol Allerding, Events Director for Experience Columbus. As summer was drawing to a close for me and my 17-year-old daughter, I was looking for an adventure to mark the beginning of her senior year in high school. 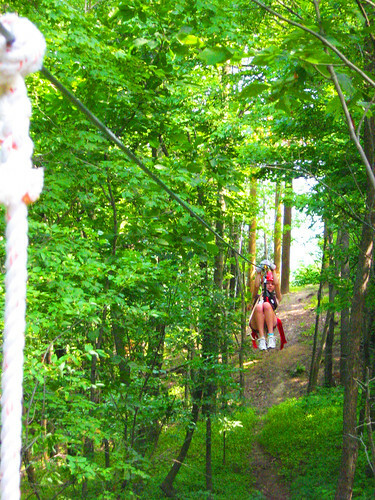 We decided upon the Zip Line Safari at the Wilds, and it did not disappoint. Neither of us had ever zip lined before, so we were excited and anxious when we arrived. Unfortunately we had made our reservation on a 95-degree day, and the 2 1/2-hour tour was not going to be complete until 12:30 p.m. It was hot, but did not detract from the adventure. 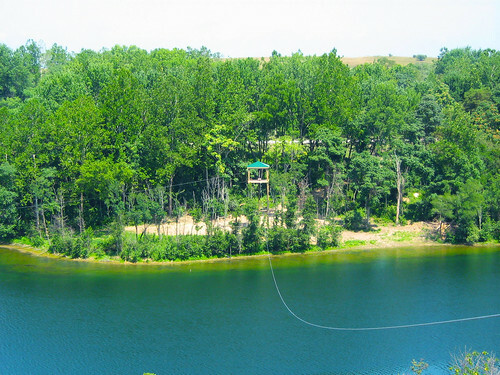 Our experience started at the highest point of the preserve by gearing up and training on a ground zip line. Gearing up is the first step in making you feel safe and secure, but it also makes you feel like a high ropes performer. Don’t know how many of you have experienced this before, but I sure that is a normal reaction. The instructors were great (Matt and Jimmy,) and they gave us the all-important hand signals and tips for not catching your fingers when you come into a tower. Our group consisted of a family of four from Michigan (Michigan State, not that other town) and two local ladies. You can bring a camera and water to drink, but everything must be secured by carabiners. I’m sure experienced zip liners have additional recommendations. I wish I had brought binoculars. Climbing up the first platform gave us a taste for the rest of our day that would be spent looking above everything else. Because of the heat, most of the animals were either in the lakes or seeking shade, so we concentrated on soaring above the preserve. Our guides stopped on every platform to point out animals in that section and give us history on the land itself; sometimes filling in with jokes and stories about the area. My daughter is 90 pounds, and required a good push off some of the longer platforms to reach the other side, but the rides were amazing. There were two in the trees, three over lakes and the rest over animal pastures, for a total of ten air rides on a cable. Sometimes, it was just amazing to be gliding above all the beauty that is now The Wilds. The most memorable was riding over 80 feet above the largest body of water and looking down at the animals that were cooling off from the hot day. I don’t know how this compares to zip lines in the trees, but it gave an amazing perspective to everything below. Our last thrill was to rappel off the final tower and that added to the fun of the day. I would recommend this adventure for anyone that loves a little twist to the ordinary!